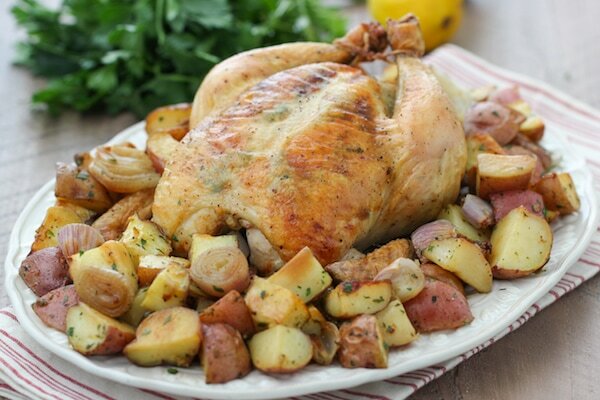 A perfect roast chicken dinner with potatoes – this one is made by roasting the chicken – crisp and golden on the outside with juicy and flavorful meat, on the same roasting pan with potatoes, so that they cook at the same time and soak in the flavors of the chicken. 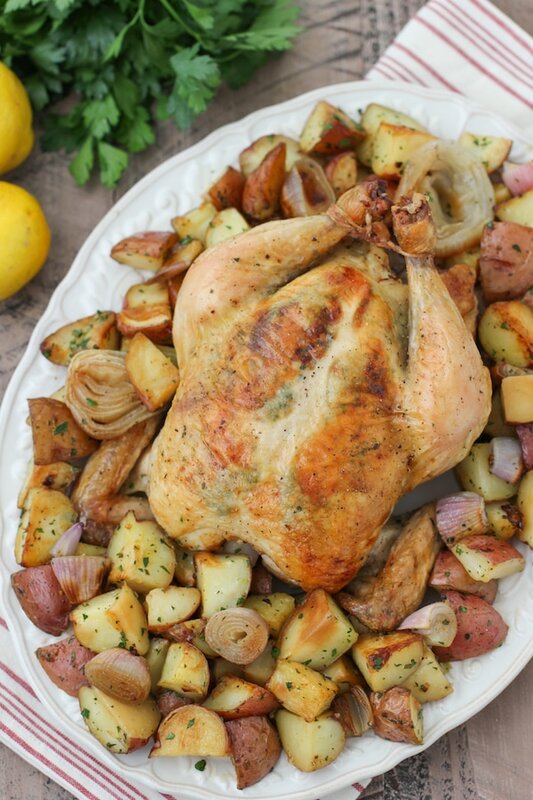 There’s something about a whole roasted chicken that says simplicity and special occasion at the same time. 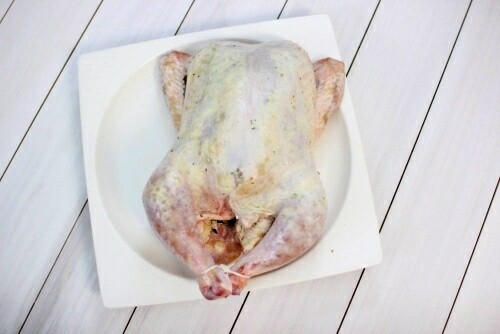 With minimum effort, you can have a gloriously crisp skinned, juicy bird to serve to your family for dinner. 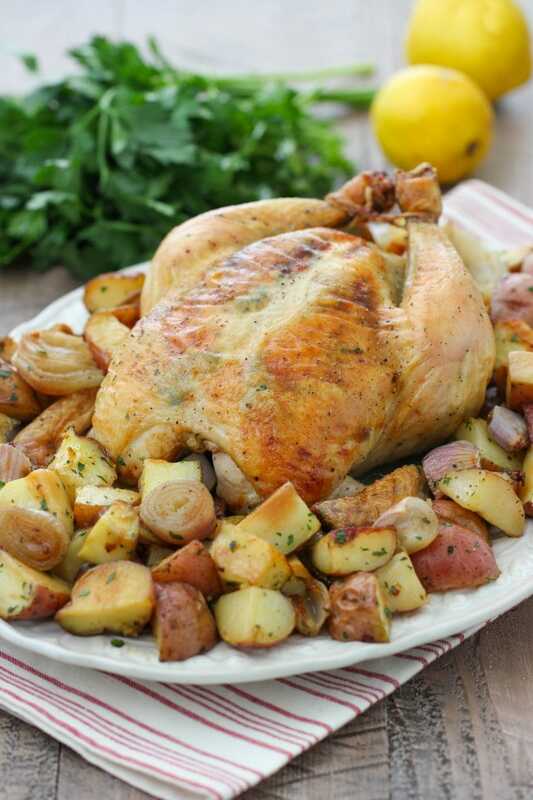 To make the roast chicken extra special, I place flavored butter under the skin and as the chicken bakes, the aromatic butter with garlic, lemon and herbs soaks into the meat and flavors the bird all the way through. If you know me, you know I’ll add potatoes to just about any meal that I can sneak them into. In this case, it makes perfect sense, since you’ll have the whole meal prepared at the same time on the same baking sheet. Dry the chicken with paper towels. Season liberally with salt and pepper all over and inside the cavity. I like to put the seasoned chicken, uncovered, into the refrigerator overnight. This will dry out the skin even more and result in a crispier skin. Also, the salt will have time to penetrate into the center of the bird, not just on the outside. 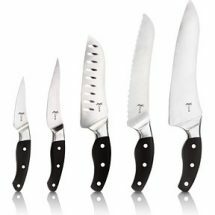 Plus, it makes my dinner prep a breeze the next day. 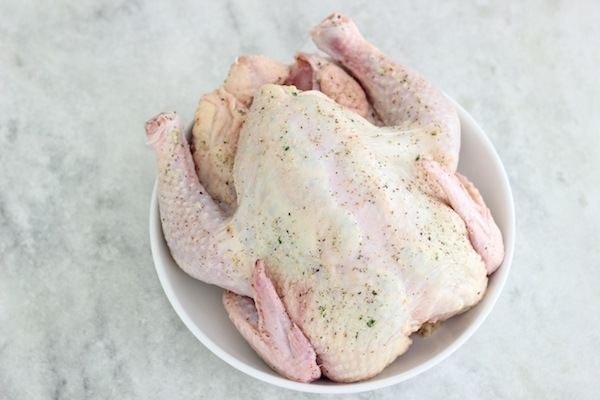 Remove the chicken out of the refrigerator and let it come to room temperature, at least half an hour. Preheat the oven to 400 degrees Fahrenheit. 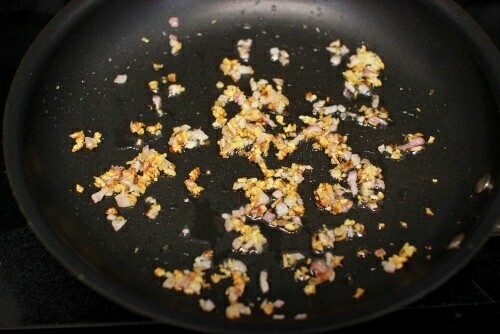 In a cold skillet, combine the oil, garlic and shallots. Cook on medium low heat until the shallots and garlic are golden. 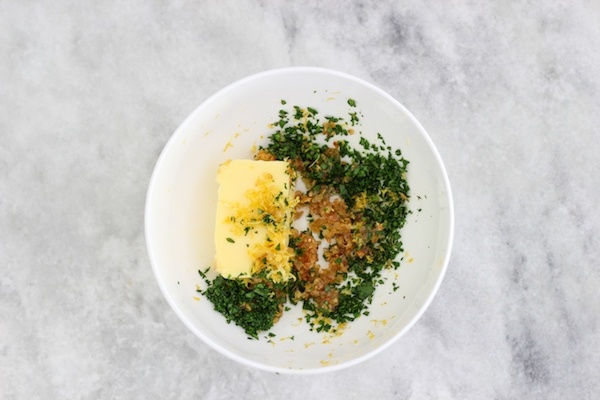 Combine the softened butter with the browned shallots and garlic, the lemon zest, parsley, thyme and season with salt and pepper. The flavored butter is totally optional. 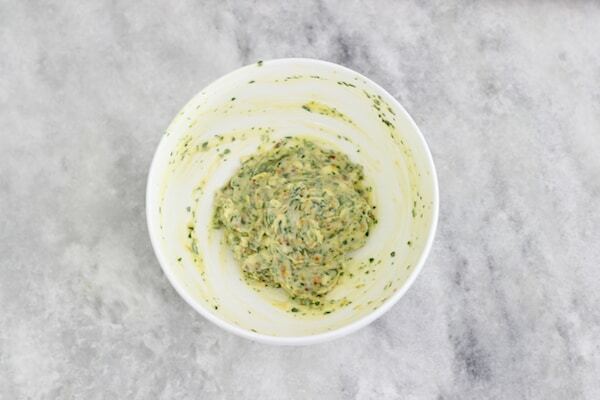 Half the time I make roast chicken without it, but when I want to make it a little more special, I like to add the flavored butter. 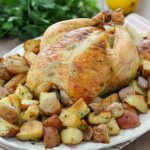 It adds so much aromatic flavor and juiciness to the chicken, especially to the breast, which can sometimes be dry and bland. I absolutely love the flavor combinations. Wash the potatoes and cut them into 1 inch pieces, leaving the skin on. Use red, gold or young potatoes for this recipe. Russets or white potatoes don’t work as well, because they tend to fall apart. 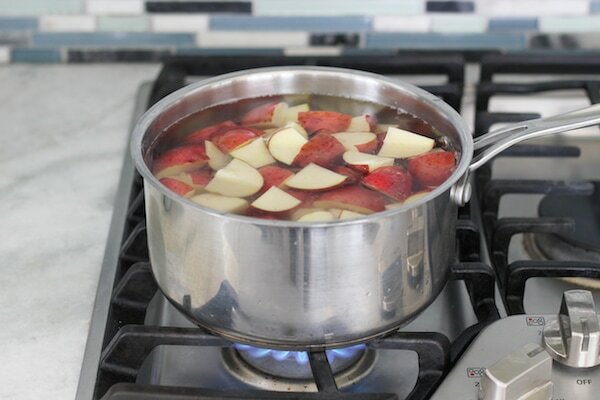 Place the potatoes into a medium pot and cover them with water. Bring to a boil and cook for another 3-5 minutes or so. 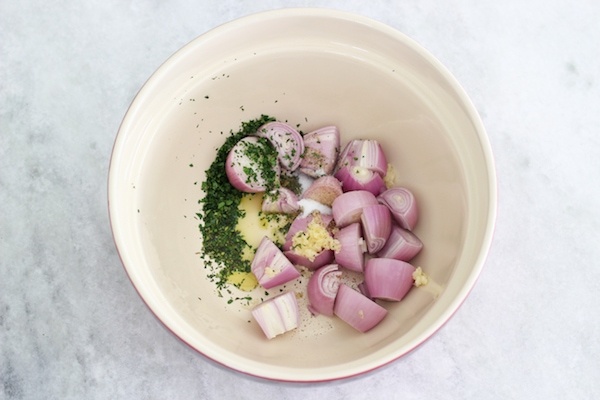 Drain the potatoes and toss them with the shallots, also cut into 1 inch pieces, garlic, herbs, oil and salt and pepper. Stuff the cavity of the chicken with one cut up onion, garlic cloves, a cut up lemon and thyme sprigs. (I use up the lemon that I zested earlier.) This is also optional. 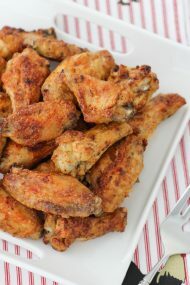 Gently spread the flavored butter under the skin, all over the breast meat and as much as you can get on the thigh meat. I usually use my hands, since they are kind of small. You can also use a spoon. 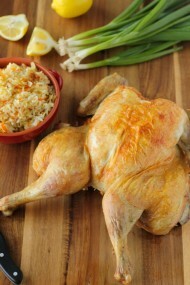 Tie the legs of the chicken together and also tuck the wings behind the back of the bird. 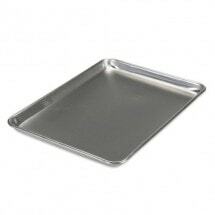 This keeps the bird in a neat, compact shape, so that it cooks evenly. Brush the chicken on all sides with some oil. 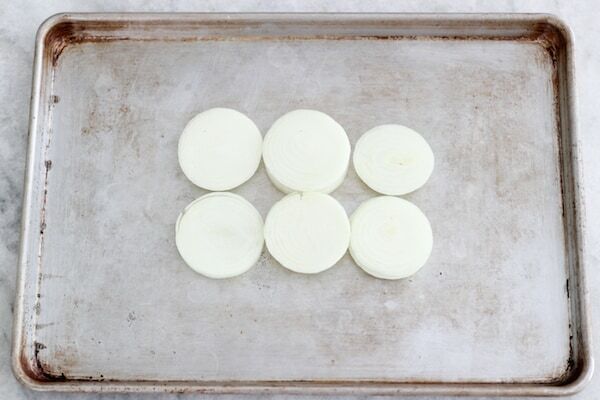 Slice 1 large onion into thick circles and place them in the center of a rimmed baking sheet. Sprinkle some salt over the onions. 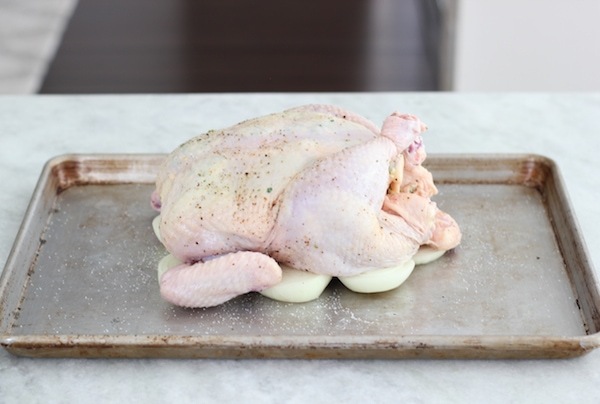 This will elevate the bird slightly from the baking sheet, and ensure that it’s not baking in a puddle of chicken juices, but gets heat all the way around the chicken. The onions will bake in the chicken juices and become golden and delicious. They are SO good. My husband and I fight over the onions every time:). Sometimes, when I’m not roasting the potatoes along with the chicken, I’ll cut up some celery and carrots along with the onion, and place the chicken on top of the vegetables with just a small amount of broth. After the chicken is cooked, I use the very flavorful drippings to make gravy. YUM! Place the chicken on top of the onions. Roast the chicken for about 20 minutes. 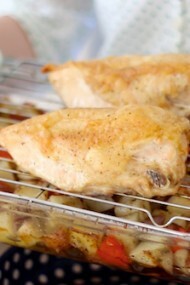 Add the potatoes to the hot baking sheet and spread them around the chicken. If there are any excess chicken juices on the baking sheet, drain it off before adding the potatoes. Continue roasting for another 40-50 minutes or so, depending on your oven and the size of your chicken. You can mix the potatoes about halfway through, to coat them in the chicken drippings and get them to brown more evenly. Sometimes the breast area skin can start to get brown too quickly. Cover it up lightly with some aluminum foil, to prevent it from getting too brown. 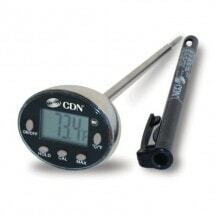 Roast the chicken until the breast meat register 165 on an instant read thermometer and the thigh meat registers 175 degrees. Take out the chicken and let it rest for about 10 minutes. Meanwhile, if the potatoes are not as golden as you’d like, return them to the oven and broil for a few minutes on all sides to crisp them up even more. Garnish with more fresh herbs, like parsley, thyme, dill, green onions. Dry the chicken with paper towels. Season liberally with salt and pepper all over. The flavored butter is totally optional. Half the time I make roast chicken without it, but when I want to make it a little more special, I like to add the flavored butter. Place the potatoes in a medium pot and cover them with water. Bring to a boil and cook for another 3-5 minutes or so. 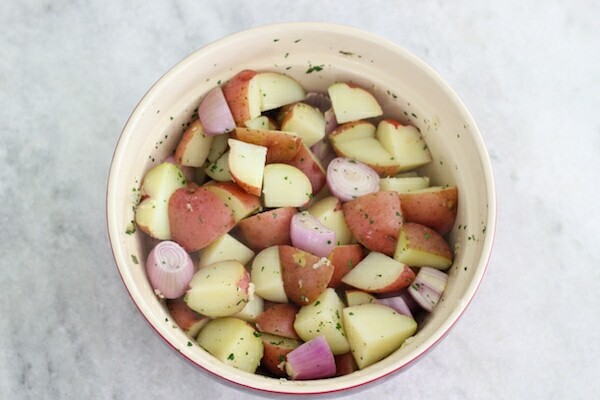 Drain the potatoes and toss them with the shallots, also cut into 1 inch pieces, garlic, herbs, oil and salt and pepper. 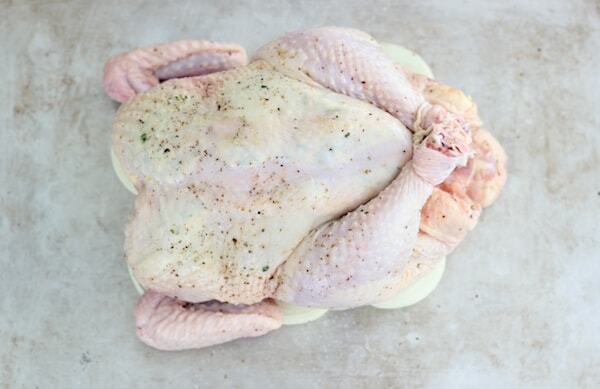 Tie the legs of the chicken together and also tuck the wings behind the back of the bird. Stuff the cavity of the chicken with one cut up onion, garlic cloves, a cut up lemon and thyme sprigs. (I use up the lemon that I zested earlier.) This is also optional. Gently spread the flavored butter under the skin, all over the breast meat and as much as you can get on the thigh meat. Brush the chicken on all sides with some oil. Slice 1 large onion into thick circles and place them in the center of the baking sheet. Sprinkle some salt over the onions. Roast the chicken for about 20 minutes. 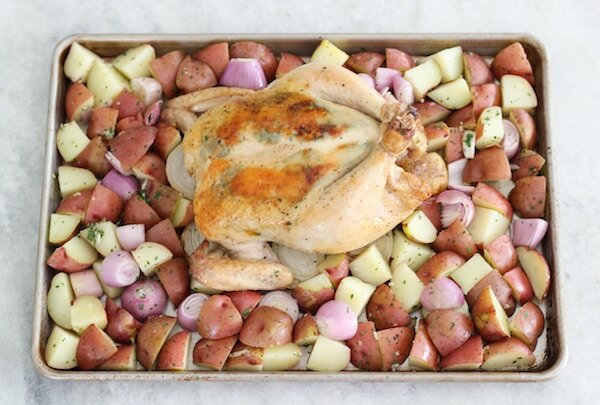 Add the potatoes to the hot baking sheet and spread them around the chicken. If there are any excess chicken juices on the baking sheet, drain it off before adding the potatoes. Continue roasting for another 40-50 minutes or so, depending on your oven and the size of your chicken. You can mix the potatoes about halfway through, to coat them in the chicken drippings and get them to brown more evenly. Sometimes the breast area skin can start to get brown too quickly. 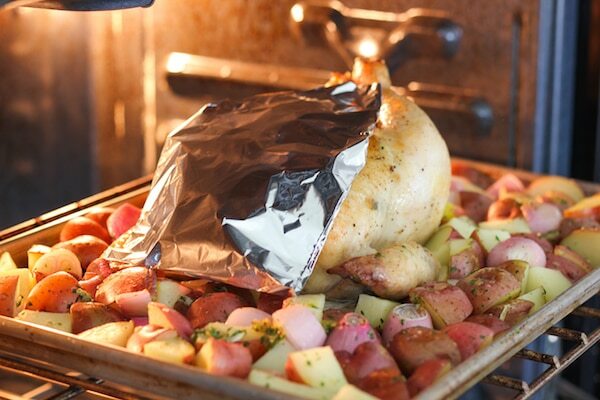 Cover it up lightly with some aluminum foil, to prevent it from getting too brown. 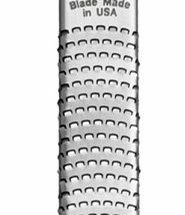 Roast the chicken until the breast meat register 165 on an instant read thermometer and the thigh meat registers 175 degrees. I made this today for our Saturday dinner; followed your instructions to a “t” and it was delicious!! Very juicy and not dry like those rotisserie store bought whole chickens 😀 We all loved it, it was well worth the effort. Thanks! That’s great! I’m so glad you enjoyed this meal. It’s one of our favorites. I make it all the time for my family. 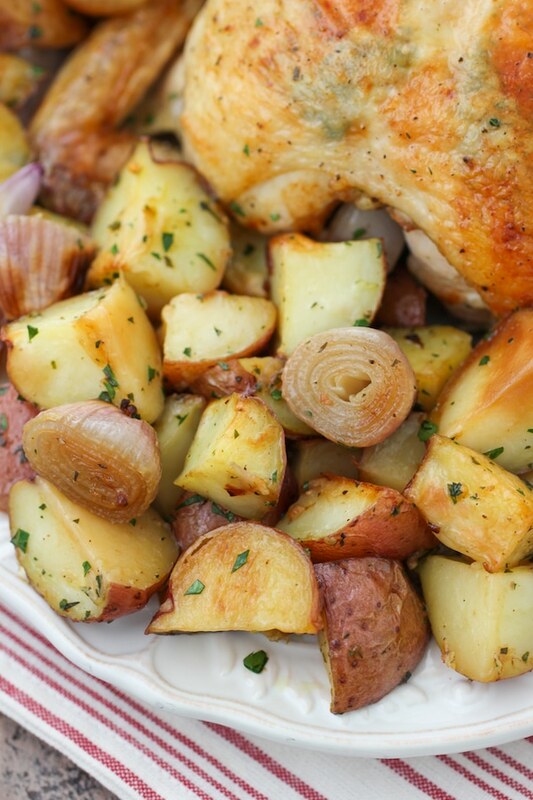 I made this yesterday and it was perfect, even the breast was juicy, especially we loved potatoes with onions, delicious! I’m so happy to hear that, Yulia. I love roast chicken for dinner. And we definitely love the potatoes and especially the onions:). What do u do with the giblets ? Man! I’m wiping the drool off my chin just looking at the pictures! And you’re right a whole roaster does kind of give a simplistic feel to a delicious meal. Well done! It was delicious and I loved the onions at the bottom. Just wanted to know, how in the world do you turn a very hot chicken around…I tried…and ended up picking up the onions and tearing the skin…Mine turned out delicious, but not picture perfect. Hi Liliya! I use paper towels to hold the chicken, since it’s very HOT. Also, I grab the chicken where there is very little skin, at the neck cavity and the cavity on the other end of the bird. This way, there is barely any skin to tear. Sometimes I use a fork instead of paper towels, using two forks, I also hold the chicken by both cavities, and quickly flip. I’ve had lots of practice though. I make roast chicken a lot:).